The bar has been raised at Bishop Mora Salesian High School as the Mustangs ploughed through the Northeast section of the CIF Division XIII play-offs to capture their first ever football championship. Salesian had the home field advantage for the game that was played at their Soto Street at Whittier Boulevard campus on Saturday, December 7th. From the opening kick-off the Mustangs played with focus and purpose testing their opponent, Mission Prep High School, from San Luis Obispo. It was a lively and exciting first quarter as both squads were busy scrambling after fumbles punts and QB sacks until nerves were quelled and sophomore sensation, Felipe Mesa, broke off a 61 yard run and a couple of plays later the quarter ended with a 0-0 draw and the Mustangs knocking on the door at the Warriors eight-yard line. A minute and 35 seconds into the second quarter the Mustangs struck first and never let up as defense and offense worked in tandem to dominate the Warriors. Mission Prep followed with a three and out series and punted to the Mustangs who quickly struck through the air to receiver Kelly for a 63 yard streak to pay dirt and a 13-0 lead. 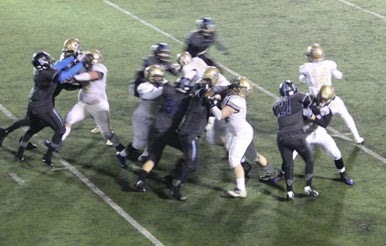 Once again the Warriors could not break the poised defense of Salesian and had to punt the ball away. Three minutes and ten seconds after the previous score, the Mustangs once again went to the air for a 42 touchdown run that caused the capacity crowd of nearly 2,000 mostly Salesian High School fans to roar in approval as by then everyone could feel the championship run coming to fruition. The ensuing kick-off only helped to cement a sense of the inevitable as the Warriors flubbed the catch allowing the Mustangs to recover the fumble on Mission Prep’s 32-yard line. Salesian’s game worked its way into the frazzled and beat heads of the opponent who could not withstand the onslaught of a team that performed with its eye on the prize and would not be denied. The fervor from the stands cascading onto the field was electric. The interplay of energy between the team and fans was palpable as it mounted to a crescendo of cheers conducive to a jolly atmosphere worthy of a championship game. The second half was a little more competitive as Mission Prep contained Salesian to one score in the third when Marques Ware caught a 20-yard pass for a touchdown. The final score was a 34-0 thrashing of the Warriors, who had defeated the Mustangs the prior year. And notably, Felipe Mesa continued to dazzle the fans as he patiently searched his way down field always turning inward instead of running out of bounds to find open field down the middle. With 33.6 seconds left the Mustangs lined up for the victory formation and the overwhelmingly blue and white garbed fans burst into celebration. An exuberant contingent of students ran onto the north end of the field to exult in their delight before heeding the call to vacate the field so that the award presentation could be made. Meantime, the victory bell had been wheeled in and rung. It certainly must have been a long and quiet ride back to San Luis Obispo for the Warriors whose sole consolation was the runner up plaque to take home. “It was a long time coming,” said Ray Covarrubias from the class of 2003, referring to the capture of the championship title that had been eluding the Mustangs for a couple of years as they inched closer to this victorious evening. An argument can be made that this victory was won the prior week when the Mustangs defeated back to back defending champions, Rio Hondo Prep (from Arcadia), in a close contest that was also played at the Boyle Heights campus. Rio Hondo threatened to tie the game with one minute and 14 seconds left in the third quarter when a sloppy hike caused a missed extra point. First year head coach, Angelo Jackson, who served as assistant for four years, led the Mustangs to an 11-2 record after going 8-2 in league. When the Mustangs hoist their first CIF-SS Football Championship banner at Salesian High School’s gymnasium, it will be displayed alongside other CIF-SS banners now displayed for soccer, cross country and most recently the 2009 volley ball championship. It was a good 2013 for the Mustang sports program, as the cross country team placed third in state at Fresno in CIF-SS, Division 4 and with Thomas Navarro placing a competitive 7th overall. All this success for the Boyle Heights campus of Bishop Mora Salesian High School was more than apparent among parents and students at the school's annual Open House, held on January 12, 2014.